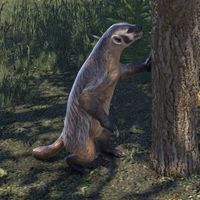 Badgers are small passive creatures found around the Gold Coast. 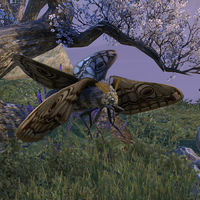 A small Daedra resembling a winged humanoid. 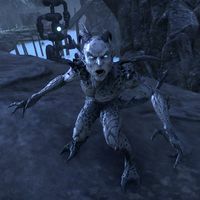 Banekin are associated with Molag Bal and use powerful shock spells in combat. They can speak Tamrielic, and are sometimes used as familiars by powerful wizards. 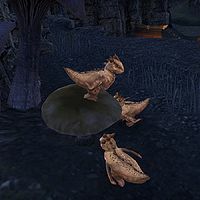 Bantam Guar are small, docile creatures native to Morrowind, that are part of the scuttler family. They are also commonly called "ugly chickens" due to their appearance and behavior, and like chickens, are raised for eggs and meat. Despite the name, they are not related to guar. A type of fabricant fish that can be found in the oily waters of the Clockwork City. It is named after Barilzar. Bats are found flying in caves and dungeons, traveling in groups. They are related to Vampires, as Vampire Lords can transform into a cloud of bats, or use bats to attack enemies in combat. See also: Giant Bats. 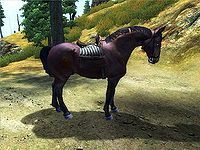 A breed of horse in Cyrodiil, with a dark brown color. The Imperial Legion train many of these as mounts. Bears are large, vicious predators that will attack people if found infringing on their territory. They are impressive creatures, much larger than the average adventurer, especially when standing up on their rear feet. Bears have two main types of attack: biting, or standing up on the rear legs and mauling you with their paws. They live either in the wilderness or in their cave lairs. Bees are yellow-black insects which live in hive colonies in forested areas. Both the bees and their hives are commonly used as ingredients in alchemy, as well as the Honey they produce. Behemoths are hulking bipedal Argonians. They have powerful melee attacks and can also spew poison. It is assumed that they became behemoths after ingestion of the Hist Sap. 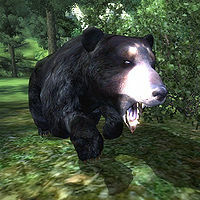 A smaller species of bear found throughout the woodlands of Tamriel. 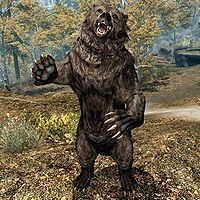 Some Spriggans have the ability to magically summon bears to defend themselves or attack passersby. 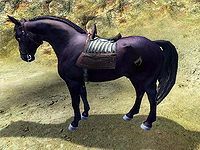 The fastest of the five breeds of domesticated horses available in Cyrodiil. Black horses have also been sighted in the wilds of Skyrim. 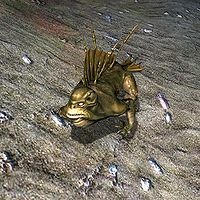 A type of fish that can be found in rivers on Auridon. A type of mollusk that can be found in the cold waters of the Wrothgarian Mountains. Boars are small, relatively slow animals with dangerous tusks. They are found in Plains, Swamps, Forest, and Rainforest regions. 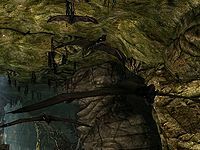 Related to the Bristlebacks of Solstheim. 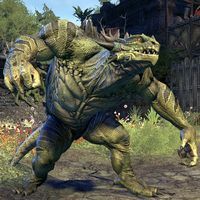 Bog Blights are Argonian zombies that can be found in Murkmire. 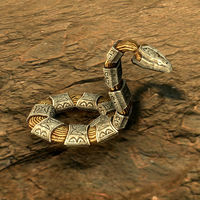 They are usually found near Argonian grave-stakes and may rise if the grave-stakes are disturbed. They are known to rush people and then explode, possibly a result of their corpses being left out in the swamp water. 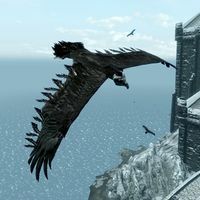 Bone hawks are undead birds found circling Castle Volkihar. Its body is similar to a regular hawk, but its head is an exposed skull and the body is darker. 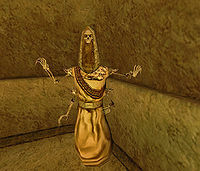 Bonelords are a form of revenant that is usually found protecting the tombs scattered throughout Morrowind. Bonelords can curse their opponents' attributes (Endurance/Speed), are immune to Normal Weapons, and resistant to frost, poison, and shock. 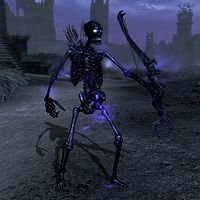 Bonemen are skeletal undead found within the Soul Cairn, where they serve the Ideal Masters for eternity. They are often ghostly, and can be tinted black or red. 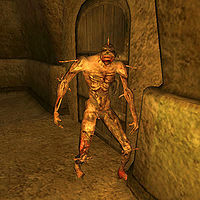 Bonewalkers are a form of revenant that guards the tombs throughout Morrowind and can be summoned by magic users. Though not as powerful as other undead, the Bonewalker is feared for the terrible curses it can bestow upon its foes. Bonewalkers are resistant to frost, poison, and shock attacks. 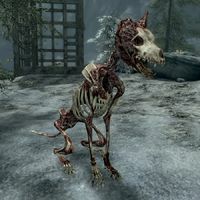 Bonewolves (or Bone Wolves) are an undead type of wolf haunting the old tombs on Solstheim. 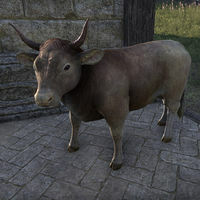 Bounders are horned bipedal creatures native to the Bend'r-mahk region of Hammerfell. They are similar in appearance to wormmouths. Bounders have the ability to paralyze their opponents. Their skin is known to have powerful alchemical effects. A type of Fabricant resembling a snake. 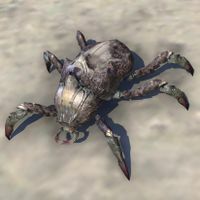 They are found in the Clockwork City and are often kept as pets. They can be powered by either soul gems, animo cores, or steam power. 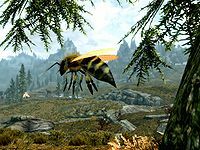 Insects that can be found hovering all across Summerset Isle. 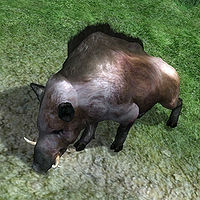 Bristlebacks or Tusked Bristleback are large tusked boars that can be found on Solstheim, and are known for their amazing ability to reflect magical effects used against them. They are often used by Rieklings as mounts. A type of fish that can be found in Reaper's March and Coldharbour. A larger, more dangerous species of bear. 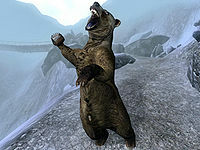 Like other bears, they are typically resistant to the cold and frost type spells. They are herbivores, raised on farms. 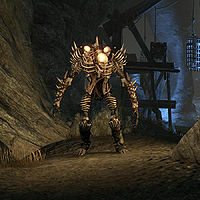 A mysterious variant of spriggan that appeared on Solstheim after the destruction of the Hirstaang Forest following the Red Year. They have the ability to harness fire. 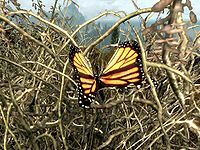 Butterflies are a species of flying diurnal insect. This page was last modified on 14 March 2019, at 00:58.